WEST WINDSOR – One of Trenton’s oldest employers, a statewide business association, and a couple with a passion for music will be honored by Mercer County Community College (MCCC) during the silver anniversary of “Spring Into Student Success,” the MCCC Foundation’s signature fundraiser for student scholarships. The event will be held on Thursday, March 27, from 6 p.m. to 9 p.m. at Mercer Oaks, 725 Village Road, in Princeton Junction. Event co-chairs are Nina Melker, chair of the MCCC Foundation Board and senior vice president at Hopewell Valley Bank, and Mercer County Freeholder Pasquale “Pat” Colavita Jr. This year’s 25th anniversary event features a silent auction and an awards presentation honoring community partners who have contributed to higher education and student success, as well as deserving students who have benefited from past “Spring Into Student Success” fundraisers. Musical entertainment, floral arrangements, and photography will be provided by MCCC students. 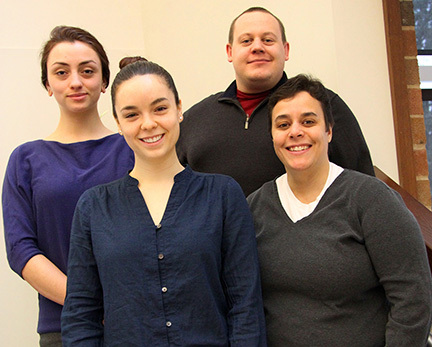 Among the Mercer students participating in MCCC's 25th anniversary "Spring Into Student Success" fundraiser are, from left: Rachele Weintraub, Celina Hicks, Carl Fedorko, and Rowena "Sam"Beauchamp. Receiving the Distinguished Benefactor Award are Robert and Leslie Doll of Princeton, who are widely recognized among central New Jersey’s most generous philanthropists through their dedication to the community. Both are loyal supporters of MCCC’s WWFM The Classical Network, and lead the Global Executive Leadership Forum. Robert, chief equity strategist and senior portfolio manager at Nuveen Asset Management, is organist and choir director at Westerly Road Church in Princeton, and serves on the boards of several not-for-profit organizations. Leslie serves on the Board of Trustees of the Lawrenceville School. The recipient of the Spirit of Education Award is the New Jersey Business & Industry Association (NJBIA), an organization that has partnered with MCCC and the New Jersey community college network to provide literacy and workplace training, in cooperation with the New Jersey Department of Labor and Workforce Development. Through the Basic Skills Workforce Training Program, the employees of companies and not-for-profits of all sizes can receive training in English as a second language, computer applications, math, and communications. NJBIA provides this service free of charge. Each year, approximately 25 to 30 employers in Mercer County take advantage of the grant-funded classes through the Mercer Institute of Management and Technology Training, serving more than 1,000 students. The Distinguished Corporate Partner Award recipient is New Jersey Manufacturers Insurance Company, which is celebrating its 100th anniversary this year. As part of its centennial celebration, NJM made a generous $100,000 gift to support the development and expansion of MCCC’s Trenton campus. The gift reflects NJM’s roots in Trenton, its commitment to the well-being of the city, and its dedication to the development of workforce skills needed by Mercer students as they pursue their career goals. A plaque recognizing the company’s contribution is displayed outside the Career Services Center on the Trenton Campus. Tickets are $120 each, or two for $225. Businesses and community members are invited to participate in the “Spring Into Student Success!” scholarship fundraiser through corporate sponsorships, silent auction donations, and tickets to the event. For more information, visit www.mccc.edu/give, e-mail foundation@mccc.edu or contact Tatiana Dodge at (609) 570-3607.